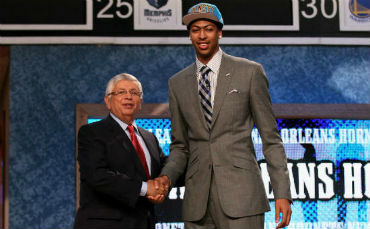 The 2012 NBA Draft kicked off just how everyone around the sports world expected, with Kentucky’s Anthony Davis going to the New Orleans Hornets as the No. 1 overall pick. He was directly followed by his former Kentucky teammate Michael Kidd-Gilchrist, who went No. 2 to the Charlotte Bobcats, a minor deviation from most NBA analysts’ projected draft boards. This made the Kentucky Wildcats the only school ever to see its players go one and two in the draft. Most analysts had Florida Gators shooting guard Bradley Beal in their two-spot, but he slipped to No. 3 instead, heading to the Washington Wizards, where he is expected to provide former No. 1 overall pick John Wall with some much-needed help, especially on the offensive end. After the Cleveland Cavaliers took Dion Waiters with the No. 4 pick, the Sacramento Kings scooped up arguably the best player in terms of character, power forward Thomas Robinson from Kansas. Robinson, who played strong for Kansas all season despite losing his mother and both grandparents in the past year, was accompanied by his 9-year-old sister and had previously promised her anything she wanted for her birthday if he was to get drafted. Though Thomas had hoped to go No. 2, he was just grateful and happy to be there. Damian Lillard, Harrison Barnes, Terrence Ross and Andre Drummond were the next four picks (in that order), going to the Blazers, Warriors, Raptors and Pistons respectively. Then, the New Orleans Hornets appeared to have struck gold yet again with the 10th overall pick as they took Duke’s Austin Rivers, the son of Doc Rivers who was the top prospect heading into college just a year ago. While many critics question his maturity, what they can’t question is his raw skills on the court. Hornet fans had to have been jumping for joy after receiving two potential NBA stars in the first round. Now, they’ll probably focus on getting shooting guard Eric Gordon to return to the team next season, giving them three great young talents. Perhaps the most disappointed player in the draft room on Thursday night was Ohio State’s Jared Sullinger, who slipped all the way to the Boston Celtics as the 21st overall pick. Sullinger has been hampered with back issues since over the past year after being considered a for-sure top five lottery pick in the 2011 NBA Draft, if he had declared for it. The biggest winners in the 2012 NBA Draft were the New Orleans Hornets, who landed two potential studs and the Kentucky Wildcats, who saw a record-tying (with UNLV’s 1977 team) six players get drafted on Thursday (Terrence Jones, Marquis Teague, Doron Lamb, Darius Miller, as well as Davis and Kidd-Gilchrist. 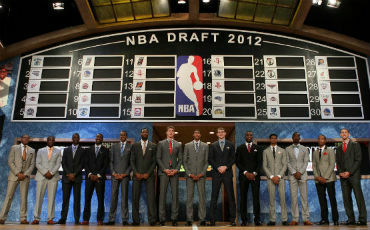 It will certainly be exciting to see how all of the players in this year’s draft pan out in the NBA next season. When the NBA gets going again in the fall, be sure to visit FreeCast for free online coverage of all the NBA action.